Michael Haynes is 91 and tired of a crumbling world. A cancer diagnosis makes him glad – heâ€™s certain his death will improve things for his children. One medical miracle later, followed by a car accident that should have been fatal, and dying doesnâ€™t seem to be in the cards. Michaelâ€™s learning something shocking about the universe, and the government wants in. Michael must contend not only with living forever but also with stopping his family from tearing itself apart. 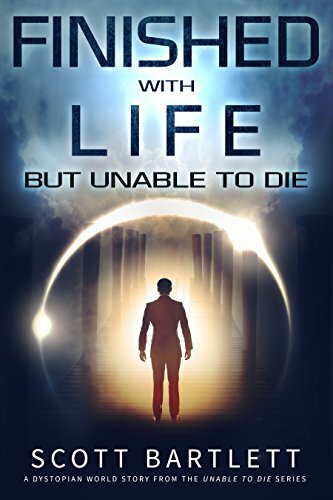 Finished with Life is Book 1 in the Unable to Die dystopian science fiction series. If you like fast-paced fiction that tackles fascinating ideas in a new way, youâ€™ll love this mind-bending series from a multi-award-winning author. Download Finished with Life today to embark on an epic journey of a series! What makes the Unable to Die series stand out? Itâ€™s a number of things, really. When I set out to write these books, I wanted to create a compelling mix of the sort of books I like to read. I ended up with something you might call a cyberpunk adventure set in an increasingly dystopian society. I had a lot of fun writing it, and so far readers seem to be having just as much fun reading it. Iâ€™m particularly proud of the bookâ€™s real-world relatability. A lot of us have known an elderly person who feels ready to pass on. Past a certain age, some would even call that impulse natural. Having my 91-year-old character discover heâ€™s immortal made for an entertaining twist on the reluctant hero figure. How far into the future does the story go? I donâ€™t want to spoil anything, but the series format allowed me to carry the premise a lot further than a standalone story typically would. A lot of things develop in unexpected ways, from the character level all the way up to the fate of the world. It gets pretty epic. The Unable to Die series is a riveting chronicle of the future that will keep you guessing. There are times this series will have you wondering whether youâ€™re reading utopian science fiction instead of a dystopian world story. But it all becomes clear by the end. Why should readers give the Unable to Die series a try? Because itâ€™s a gripping tale of a possible future. Anyone interested in artificial intelligence, environmental catastrophe, economic precariousness, and immortality is in for a treat. Iâ€™ve been hearing from readers that theyâ€™ve read the entire series in a single day.